Major Robert A. Doss, Jr. attended boot camp at MCRD San Diego in February 1975 at the age of 17 and was meritoriously promoted to Private First Class upon graduation. He was then assigned to the Infantry Training School at Camp Pendleton, CA where he was trained as a mortarman before being sent to Camp Schwab, Okinawa to serve with the 3rd Battalion, 9th Marines (3/9) 81mm mortar platoon. He was meritoriously promoted to Lance Corporal and Corporal during his Okinawa tour. In September 1976, he returned to the United States, joining G Company 2/8 at Camp Geiger, NC as the 60mm Mortar Section Leader. He was meritoriously promoted to Sergeant in February 1977. He was later transferred to K Company 3/8 and A Company 1/8 where he served as the Weapons Platoon Sergeant before joining K Company 3/2 at Camp Lejeune, NC. He was selected for promotion to Staff Sergeant in January 1979, then was selected for the Marine Corps Enlisted Commissioning Education Program (MECEP) that February. After completing the MECEP Preparatory School in San Diego, he was transferred to the University of Missouri in Columbia where he received his Bachelor of Arts Degree in Political Science. He was commissioned a Second Lieutenant in May 1983. Upon completion of The Basic School and flight training, he was designated a Naval Aviator in March 1985. He reported to HMT-204 at MCAS New River, NC for training as a CH-46E helicopter pilot, then he was transferred to HMM-365 at New River where he served stints as Legal Officer, Flightline Officer, Airframes Officer, Quality Assurance Officer, and Aviation Safety Officer. He joined HMM-263 in July 1990 to serve as the Assistant Aircraft Maintenance Officer. In July 1991, he was transferred to Whiting Field, FL to serve as a helicopter flight instructor at HT-8. While there, he held billets as the Public Affairs Officer, Training Officer, and Standardization Officer. In 1992, he was selected as the HT-8 Bell Jet Ranger Flight Instructor of the Year and in 1993, he received his Master of Science degree in Management from Troy State University. In September 1994, he returned to HMT-204 for refresher training and subsequently reported to HMM-162 at New River to serve as the Operations Officer, later as the Tactics and Future Operations Officer, then finally, as the Aircraft Maintenance Officer. He was promoted to his present rank on 1 November 1994. Major Doss flew missions in Operations DESERT SHIELD and DESERT STORM in the Middle East in 1990 and 1991, Operation EASTERN EXIT in Somalia in 1991, and Operations DECISIVE ENDEAVOR in Bosnia-Herzegovina and ASSURED RESPONSE in Liberia in 1996. His personal awards and decorations include the Air Medal with Combat "V", two Strike/Flight Air Medals, three Navy and Marine Corps Commendation Medals, the Combat Action Ribbon, and two Good Conduct Medals. He has flown more than 4000 accident-free flight hours. 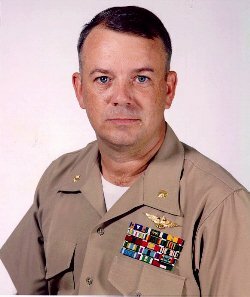 Major Doss assumed command of the newly formed Aviation Maintenance Squadron One in August 1996. In August 1998 Major Doss retired from the Marine Corps after over 23 years of faithful and dedicated service, Semper Fi.